Please note that the links to the content in this Part will direct you to Westlaw AU. This article considers pre-judgment interest in litigation and proposes a method to compare statutory interest on the simple basis against compound indices closer to the circumstances of the plaintiff. Comparison of the statutory interest rate against representative indices for the period 1 July 2005 to 30 June 2015 demonstrates a quantifiable bias in favour of businesses and low risk investors and calls into question the court’s assertion that statutory interest can be considered a “rough and ready guide to the prevailing interest rate at any given time”. This article reviews and considers the availability of damages for borrowing or opportunity costs including at the compound rate in common law, equity and as a debt pursuant to express terms. Liquidators often wish to sell causes of action owned by a company in liquidation. Such causes of action based on breach of duty by a director or officer can be based in the general law or in statute. The law relating the assignment of such causes of action has been afflicted by inconsistent and circular reasoning, with the result that equitable and statutory causes of action are not equally assignable. The recent enactment of the Insolvency Law Reform Act 2016 (Cth) has attempted to provide consistency and efficiency across both corporate and personal insolvency. But its success in achieving this goal may have been jeopardised by insufficient attention to the historical position regarding a liquidator’s power to assign causes of action. This essay provides a principled differentiation between ss 84 and 85 of the uniform evidence legislation. At present their respective functions are unclear, the drafting is merely “good in parts” and there is much overlap within and between the sections. Therefore their application is more difficult than it needs to be because it is not clear how they relate to each other. Clarification will be of use to practitioners, Judges, students, teachers and reformers of the law. The essential difference is that s 84 deontologically serves the protection of the suspect’s basic rights, while s 85 teleologically aims at the rejection of admissions which might well be unreliable and thus at an assurance that poor-quality evidence is not adduced. A side-effect of this difference is that s 84 typically requires some type of positive action by those in authority, while s 85 does not. 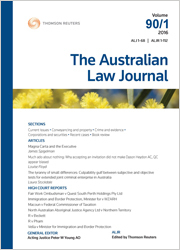 For the PDF version of the table of contents, click here: ALJ Vol 93 No 1 Contents.